The initials of Nazt’s four owners have been combined to form the name of the restaurant; it’s a wannabe slant-rhyme pun that aims to give off the feeling of a homey restaurant (it’s pronounced ‘nest’). While the name may not leave a positively lasting impression, the warm tones of chocolate and cream, with subtle light descending from a series of birdcages, and intriguing wall art, makes this bistro inviting. 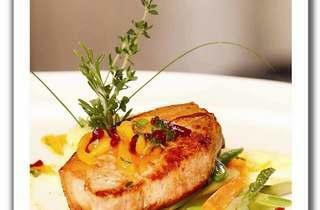 It sets the Club Street food scene aflutter with its selection of European favourites amid more modern cuisine. 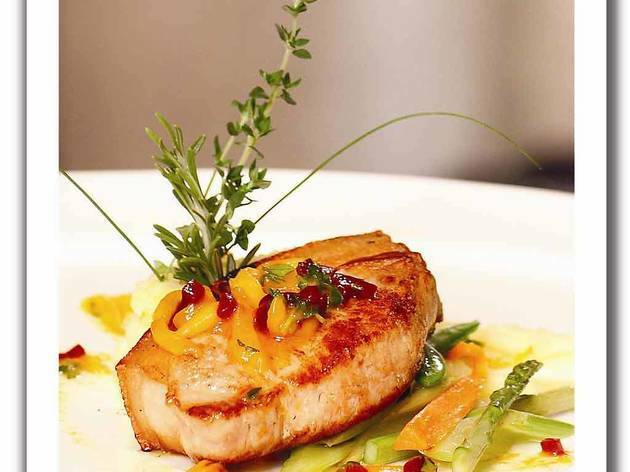 Neither pretentious nor generic, the small but varied menu throws up interesting items, including chef Alvin Tan’s Special Salad – a fresh and tart concoction of julienned apple strips and mixed berries generously drizzled in a sweet honeydew sauce. Stuffed with juicy scallops, sautéed mushrooms and then blanketed in a rich buttery hollandaise sauce, the grilled lobster thermidor was promptly demolished. Equally good was the Yorkshire pork, pan-fried till perfectly tender and served piping hot atop roasted vegetables and a peppery raspberry sauce. Desserts were a sight to behold. The mint-infused grape sorbet was paired with strawberry crumble and strangely alluring chunks of pan-seared watermelon; the melon’s warm caramelised flesh, served alongside a dollop of New Zealand vanilla bean ice cream, made for a refreshing yet creamy melding of flavours.